It is said it was the invention of the automatic elevator braking system by Elisha Otis that made the modern skyscraper a practical possibility and it is certainly hard to see how any building of more than six floors could be a practical possibility without elevators. In the mid 20th century centralised air conditioning became a practical proposition thus enhancing further the practicability of tall buildings – and, incidentally, making it possible to live and work in countries with very high ambient temperatures like the Arabian Gulf. I would suggest that the third leg of the support mechanism of tall and supertall buildings is almost certainly the automatic fire sprinkler system as it’s impossible to think of modern high risk buildings being constructed without them. It used to be an accepted truth in fire brigade practice that it was impossible to fight a fire in a building more than 30m tall from the outside. For many years this was the maximum height of a fire service ladder or hydraulic platform and as a result of this convention, most high rise (i.e. buildings more than 30m tall) have relied on internal fire fighting measures such as automatic sprinkler protection, fire compartmentation, ventilation systems, fire risers and hydrants and firefighting shafts and staircases. Anyone who thinks that the problems of managing fire safety in very tall (over 200m) or super tall (ie over 400m high) buildings is a transient issue is sadly in error. 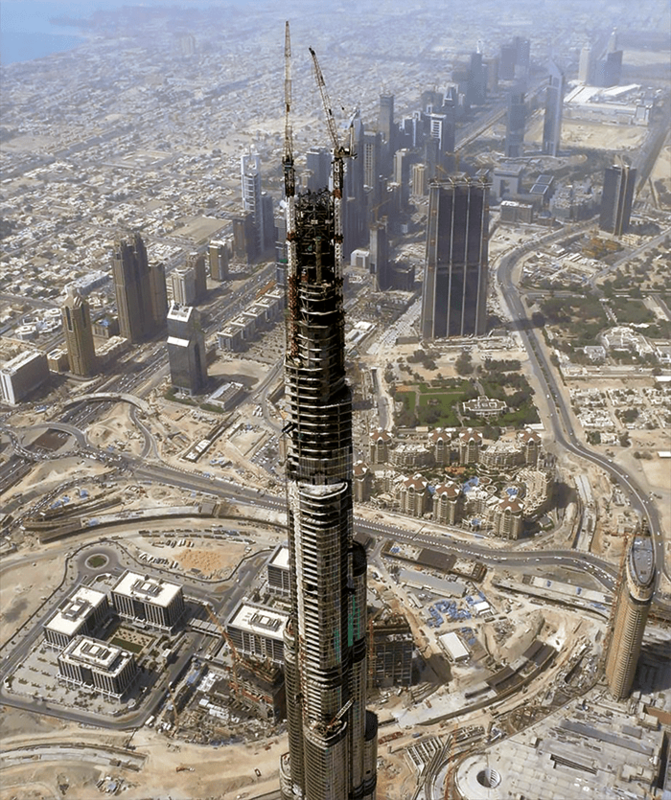 A brief trawl of the internet in 2012 revealed that there were at least 30 buildings planned or under construction that will be taller than 400m – most notably the Kingdom Tower in Jeddah which will top out at 1000m – and taking the title from the 824m Burj Khalifa in Dubai in 2018. The causes of fires in super tall building construction does not differ from such issues in conventional buildings. What is different is the scale and extent of the problems of access, the number of persons at risk, water supplies and the skills needed in fire fighting. The value of the building and the business continuity impacts must also be considered. Like all supertall buildings, Burj Khalifa’s sprinklers are central to its design. Without sprinklers, the fire strategy for the building would not be viable. In addition, within some national jurisdictions, approval will be given to sprinkler systems installed in compliance with international insurer FM Global’s data sheets. This carries on the tradition in both the US and European where insurers were originally responsible for writing sprinkler installation rules. This is still true of the UK LPC Rules for Automatic Sprinkler Systems which incorporate the full text of EN 12845 but sets out additional insurers’ requirements in certain areas. Where insurance policies are written in London or through Lloyds, compliance with the LPC Rules2 may be mandatory. These in fact provide significant additional information on innovative systems such as Extended Spray Fast Response Sprinkler systems (ESFR) which utilize wider bore pipe and larger sprinkler heads to apply greater amounts to water to fires at an early stage and are now frequently specified in warehouse protection where they can provide an alternative to in-rack systems. Some Europe-based insurers may suggest compliance with CEA 4001:2013 Sprinkler Systems Planning and Installation which is also an insurance industry standard. Despite occasional suggestions to the contrary, all sprinkler systems are designed to protect life and property. However, where the presence of a fully operational sprinkler system is critical at all times – as for example in a large place of public assembly or an hotel – then additional measures may be specified to ensure that the sprinkler system is operational even when maintenance work is taking place. Such ‘enhanced availability3’ systems may include duplicate pumps, tanks and valves and provide for the security and monitoring of valve sets. Obviously these features come at a cost so it is essential to ascertain at the specification stage whether such the client or the authority having jurisdiction believes these are essential. 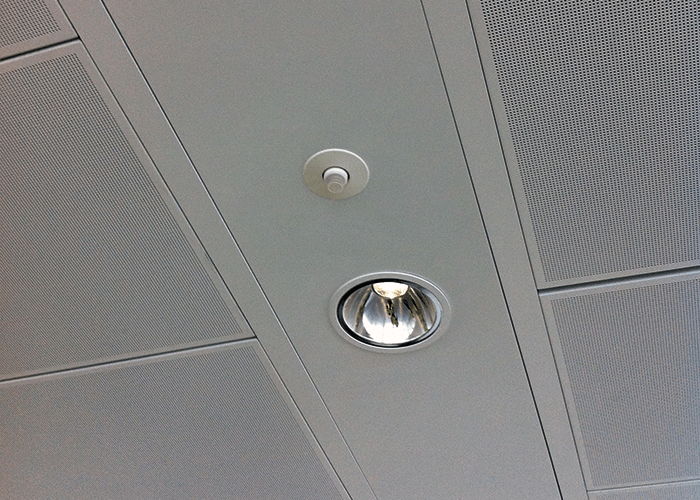 Selection of a low profile sprinkler head design can minimise visual intrusion which is often demanded by architects as here in the Shard in London. Sprinkler systems where all the pipework which is water-filled at all times are most commonly type installed. They are found where there is no possibility of the water freezing and so are almost universal in the Middle East and Gulf. A pre-action sprinkler system is a dry-pipe system linked to an automatic fire detection system which protects the same area. Operation starts when a heat or smoke detector in the protected area activates, (normally before a sprinkler head opens). At this point a ‘pre-action’ valve opens to allow water to flow into the sprinkler pipework before the first sprinkler head operates. Discharge of water will not occur until a sprinkler head operates. This type of system is quite often used in water-sensitive areas such as electrical equipment rooms, computer suites and for archive protection. Deluge systems differ from sprinklers in that the discharge heads are open and all operate at the same time, triggered by a separate detection system. Deluge systems are used to protect against high hazard activities such as in flammable liquids. The proper test and maintenance procedures undertaken by competent persons are important for all fire protection systems but are critical where fire suppression systems are integrated in the design of the building. Automatic fire suppression systems are now recognised as a key contributor to the safety of all high rise buildings and it is doubtful if such structures could be erected without them. Even when not specified by local building codes, the presence of sprinklers will guarantee the safety of the building and its occupants should a fire occur. This approach, for example is also followed in some parts of the UK where ‘Approved Inspectors’ exercise code supervision in place of municipal officials. Now published by the UK Fire Protection Association. See Annex F BS EN 12845:2015.